If a customer is looking for a strong packaging solution to shipping, the woven polyethylene material is the best option for manufacturing in pallet cover design. Woven polyethylene as a plastic in manufacturing allows for a packaging option with optimal strength. The weave is completed with a High Density Polyethylene base. High Density Polyethylene is structured as a poly in a way that gives a two-directional strength. Often, grocery store bags are manufactured using a High Density Polyethylene poly for the purpose of holding greater weight and not breaking through the bottom of the bag. This allows for a strong single directional plane with High Density Polyethylene. The weakness of this type of poly lies in the opposite directional plane. The High Density Polyethylene can easily tear (like paper) on the other directional plane. The weave in packaging allows for a strong resistance to tearing from multiple directions as opposed to an extruded sheeting. As the High Density Polyethylene weave creates a mesh of opposing strengths in the structure. 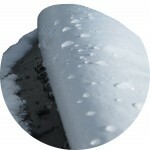 This allows greater resistance to tears in the wind or staples ripping through when packaging. 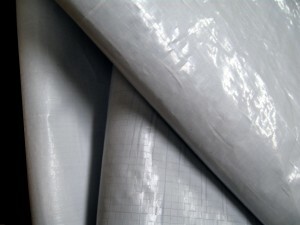 The High Density Polyethylene weave is coated on both sides with a Low Density Polyethylene. Low Density Polyethylene is known to have more stretch than High Density Polyethylene. While High Density Polyethylene will either hold or break, Low Density Polyethylene will hold, stretch, and then eventually break. When the two types of poly are combined, the product becomes useful in packaging design by allowing for a strong industrial fabric. The mixture of the weave and coating creates a water resistant and tear resistant plastic, which is perfect for industries shipping by rail and truck. Please feel free to contact Flexpak at any point to request more information about what type of plastic can be used in the manufacturing of a pallet cover for your specific product.